7:00 p.m. - 9:15 p.m.
Synopsis: "Miss Representation uncovers a glaring reality we live with every day but fail to see. 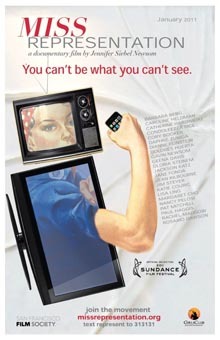 Written and directed by Jennifer Siebel Newsom, the film exposes how mainstream media contribute to the under-representation of women in positions of power and influence in America. The film challenges the medias limited and often disparaging portrayals of women and girls, which make it difficult for women to achieve leadership positions and for the average woman to feel powerful herself." Film series sponsored by the Susan B. Anthony Institute for Gender and Women's Studies, The Little Theatre, and the Multi-Media Center. Film followed by a panel discussion. Tickets are $5.